Hospitalists are physicians who diagnose and treat acute and chronic conditions of the patient admitted to the hospital. They work exclusively in the hospital. Hospitalists focus not only on the clinical aspect of patient care but also coordinate specialist consultation and discharge planning as well as ensure the quality of the care provided for admitted patients. 1 - It's the only medical specialty that is based on the patient's location and not the organ system. 2 - It's a growing specialty and it was estimated to have 44,000 doctors in 2016 according to the Society of the Hospital Medicine. 3 - By training, the vast majority of hospitalists are Internal or Family medicine followed by Pediatricians. 4 - To become a hospitalist, one needs to earn a bachelor's degree, graduate from the Medical School and complete either Internal Medicine, Family Medicine or Pediatrics residency. 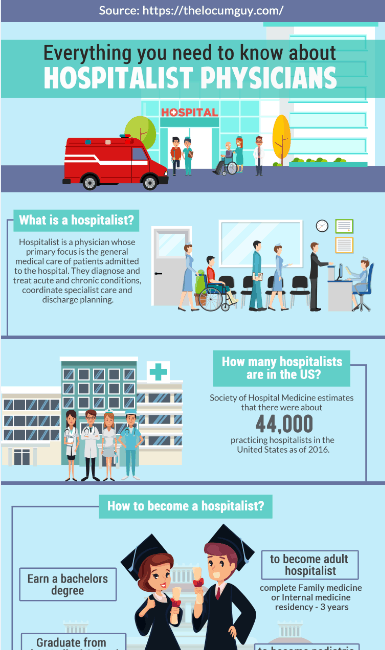 5 - The average adult hospitalist's salary is $290K/year and a pediatric hospitalist salary is $225K/year. 6 - The average number of patient hospitalist sees a day is 16 for adult hospitalist and 14 for the pediatric hospitalist.